Black Diamond Titanium Money Clip by Superior Titanium Products, Inc.
We are very excited about this new money clip! 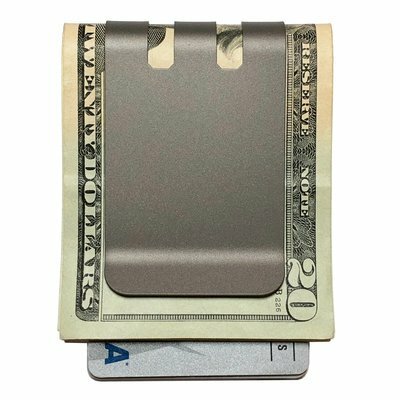 The money clip design is our tried and true titanium money clip that can hold a single bill or as many as 30 folded bills thanks to the elastic (springy) nature of titanium. It can also hold your credit cards and drivers license. The strength and durability of titanium makes this one tough money clip. Please see the accompanying charts for the technical properties of this money clip. Now what really excites us is the finish on this money clip. We used a special process that applies carbon through a plasma field to form a black diamond structure on the surface of the titanium that is as tough as nails. Okay, it is actually much tougher than nails! In fact this black diamond coating is extremely hard to scratch and does not require a clear top coat (no solar degeneration). After testing in a salt spray for 1,000 hours there was no surface effects on this coating, so no worries about taking this baby surfing, sailing or maybe accidentally swimming with it in your pocket. Of course the titanium underneath the black diamond coating is also immune to salt water, but it is important to know that the finish is tough. We hope you enjoy using this titanium money clip. 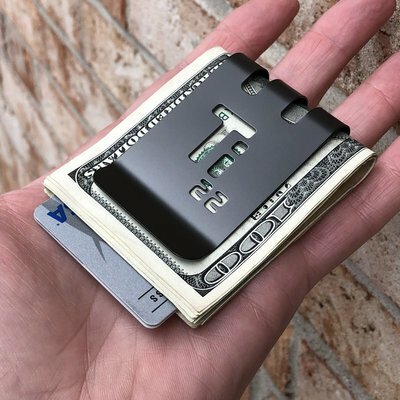 It is a combination of a cutting edge finishing technology and technically superior aerospace titanium that functions like a money clip should and looks great while doing it. 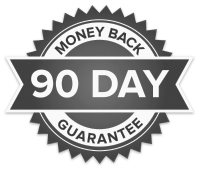 You may see some non-titanium money clips that are powder coated and this is no comparison to the diamond like structure applied using this environmentally friendly vapor deposition process. Buy a black diamond™ titanium money clip now and start impressing your friends! I have been looking for the right money clip for years and just gave up because all of the clips that I had tried were, well, quite frankly, crap (read the other 4 letter word). I picked up my order from the post office this morning. It is the first money clip that I have purchased that I feel will last longer that 1 year. It is a sleek one piece construction that is strong, very strong. 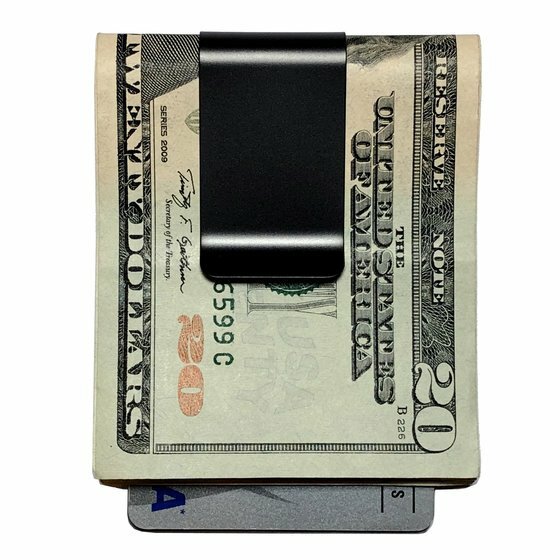 I feel that this money clip might very well be the last money clip I buy, I have high hopes for this product and hope it will live up to my expectations. Received my order. My partner is very, very pleased with it! Thank you for the fast and efficient service! Everyone asks me about the clip and they really like it, as I do too! 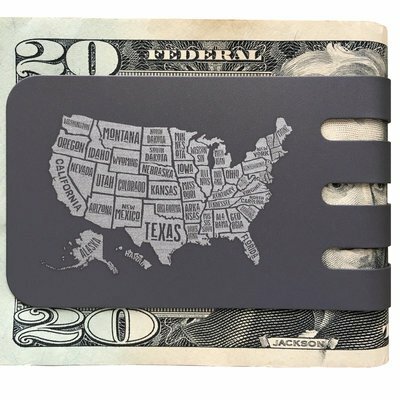 Very awesome money clip! It slides sideways , with bills in it , and slips out of my back pocket too easily . It needs to be wider , if you could engrave a persons initials or name on it . That would be great ! 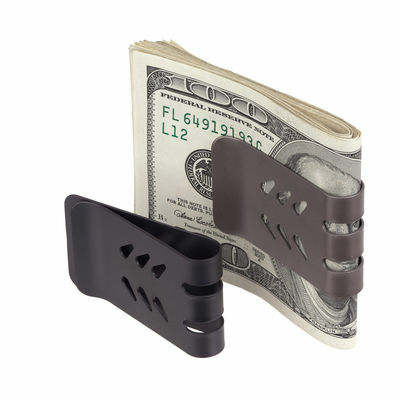 - Money Clips are best carried in front pocket to avoid sitting on them and will keep cash and cards compact and secure.